Have you ever wondered when will your money double? Actually, when I started in my journey of saving via the BPI Direct Save-up I was only wondering how my money will grow given the measly interest rate? If you ask me how it will double, I really had no idea. In one seminar I attended, this exact question was discussed. 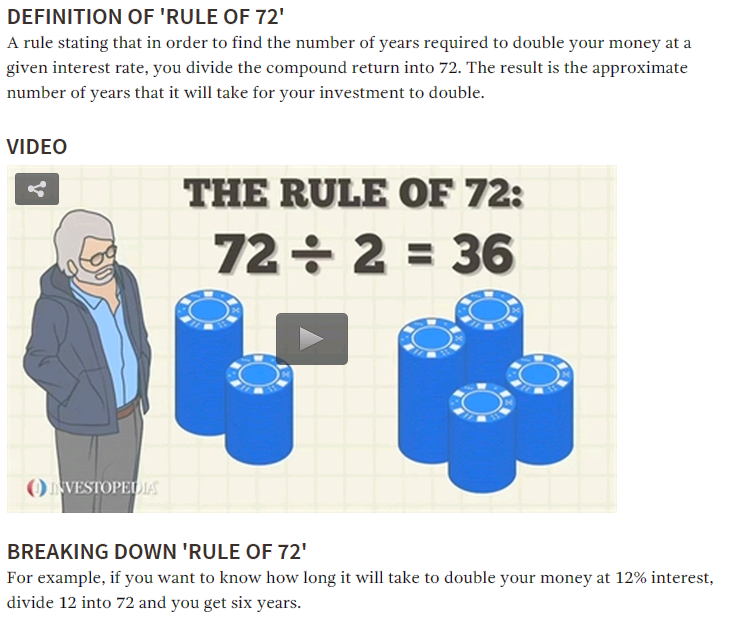 Hearing the “Rule of 72”, the Engineer in me got curious and amazed how this rule was never shared in school when I studied Economics. This is Theory 1 or one of the mathematical formulae useful for Financial Freedom which I will be sharing one by one. A savings account in the PH will give you <1% interest. For simplicity’s sake, assume 1% interest rate and your money will double every 72 years. The 1% gives a feeling of hopelessness as you will only see your money double once in your lifetime, if you are lucky. Caveat, the interest rate captured here as of March 2015. Again, do your due diligence. Know also yourself. If you have high risk appetite and tolerance, by all means go for high returns though it will also mean high risk. But at least, now we know there are investment vehicles offering different interest rates and that there is a mathematical formula that gives us an idea when our money will double. Hi wendy. I am interested in a high return,high risk. I want to buy an stock funds. Can you help me how to have an stock fund.